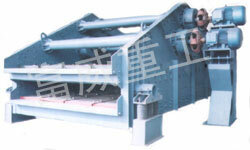 Linear Vibrating Screen (linear screen) is a new type and efficient screening equipment. It is widely used in mining, coal, metallurgy, building materials, refractory, light industry, chemical industry etc. Linear Vibrating Screen has advantages of stability and reliability, low consumption, low noise, long life span, stable vibration and high screening efficiency. Etc. When ZSG Vibrating Screen series work, the two-motor synchronous reverse placed so that generate reverse excitation force and force sieve body to drive sieve wet to make longitudinal movement. By this way led to materials on the shaker by the periodic exciting force to move out a rang of screening materials, materials screening work is finished.